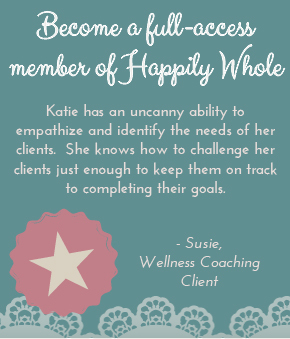 Join the Happily Whole Community! I'd love to have you as a member...the more the merrier! My hope is that this site grows into a place that touches the lives of many women on many different walks of life as they search for something real, whole and refreshing when it comes to LIVING WELL. Let’s create this community together! While there are many free places to linger here in my online home, Membership offers greater access to recipes, workouts and wellness encouragement. SIGN UP! I'll get you the tools you need to live well inside out! Member’s only recipes offering the next step to nourishing your body well. Member’s only workouts including more photos, greater depth and more detailed exercise descriptions. A Favoriting Function and your own account where you can bookmark your favorite recipes, workouts, articles and inspirational messages from this site. Happily Whole will store and organize everything so you can create YOUR OWN Happily Whole experience for each time your visit. Member’s only e-newsletters to encourage to stay on track and inform you of new member content. You will be linked up with Member’s only videos, features and even some affiliate promotions JUST FOR MEMBERS. A Happily Whole Community Forum where you can introduce yourself, meet other Happily Whole members, pose questions for me or suggest topics to discuss as a community on a quest to live well! Whenever you see the Membership STAR, that's information only available to registered Happily Whole Members. **None of the information that you share or store on this page is ever reviewed or shared in any way shape or form! I have utter respect for your privacy. You have my promise! Thank you so much. I hope to see you 'round these parts a whole lot...a HAPPILY WHOLE lot! When you become a Happily Whole Member you support this website and all that goes into it. It's where I spend more time developing ideas, programs and recipes for those of you really ready to commit. It's where I pour MORE of of personal passion and professional training. You also provide a means for it to continue living and growing so that I can ‘work’ here writing, developing and sharing new recipes and providing workouts to you! Finally, my mission is to glorify God with my work and to serve others. So, ultimately I want to make this membership valuable and affordable enough to hundreds of women with the goal to GIVE BACK with my time and resources to women and children in need right here in my community and even across the country. Dream BIG, right! ?